Welcome to Hull's Meat Company! 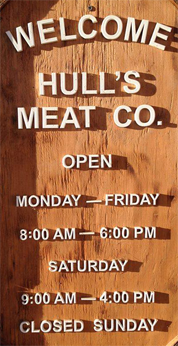 Hull’s Meat Company is proud to be a part of the community. Once you try our delicious meats and deli selections you will be hooked on Hull’s. We produce the finest beef, pork, chicken and deli meats available in Big Spring Texas. Our Cookout packs will have you firing up the barbeque for mouth-watering delicious meals. Our specials keep our customers coming back for more, because we offer delectable meats that you can afford! Check out these great specials at Hull’s Meat Company. Check out our customer reviews on Facebook and like us to see our weekly specials. Hull’s Meat Company is proud to serve our customers the best meat in town. At Hull’s Meat Company we only carry high quality fresh meat. Hull’s Meat Company has competitive pricing and delicious cheeses, deli style lunch meat, spices, and much more. We are your friendly and affordable neighborhood meat market. Try our beef jerky and taste the delicious difference today. We can also customize your orders just how you like them. So come and see our wonderful selection of top quality delicious meats at Hull’s Meat Company. Hull's Meat Company now has GIFT CARDS!!! Copyright 2014© Hulls Meat Co.